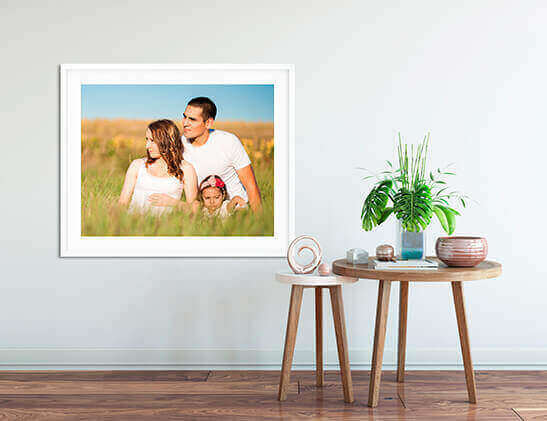 If you know all Canvas prints are not equal, discover the highest grade printed on Premium Epson Canvas. It's a new fashion among art producers and interior designers achieving a powerful impact at a low budget. Max size is 30x40; custom cut is limited to 30". 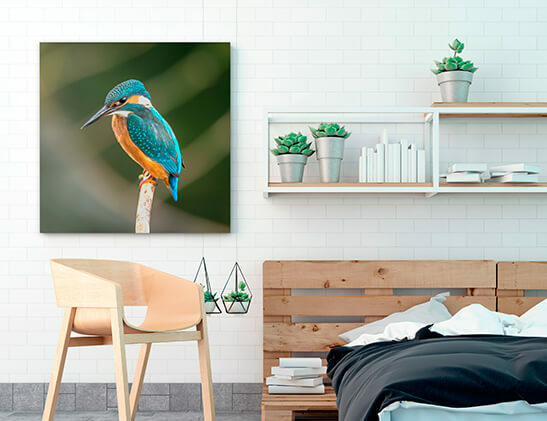 Pictures mounted under acrylic glass are crystal clear, elegant, and pure – in gallery-quality prints. The print comes with a sturdy hanger or a stand. Square, rectangular, and circular shapes. Glossy finishing is standard; reflection reducing Matte option is available for a 15% surcharge. The glass is 0.08" thick or optional 0.24" thick (add a 10% surcharge); back is aluminum black Dibond panel. Check our samples, discuss options in hanging/easel, round/straight corners, etc. 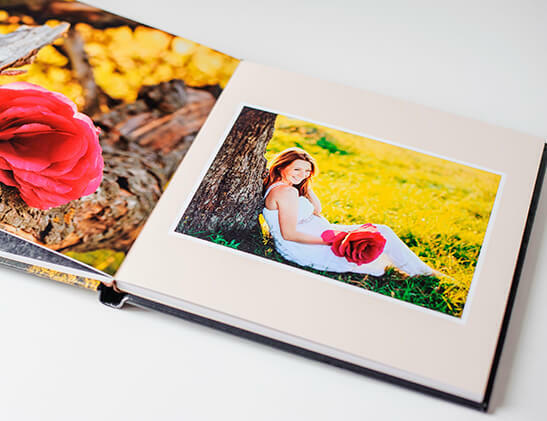 The ArtBox subtly frames your photo when viewed from the front, but shows impressive depth when viewed from the side. The solid wood lends your image a natural appearance while the aluminum brings a contemporary look. 12mm thin front, 45mm deep side. Front is textured silver or gold, side is black. Custom sizes from 6"x6" to 47"x70"
2mm thin front, 25mm deep. The metal is modern and puristic in silver or elegant in black. Custom sizes from 6"x6" to 47"x78"
Offering durability with water and tear resistance at a very economical price. Indoor and outdoor signage, trade show displays, theater backdrops, shop-front displays and floor graphics. 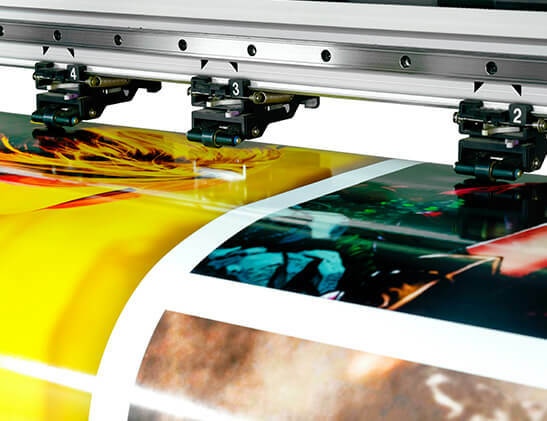 A versatile product producing deeply saturated, long-lasting adhesive print which is also water and tear resistant. Scratch, water-resistant surface with a white point never before seen on a banner substrate. Scrim-reinforced vinyl designed to create spectacular, high impact, cost-effective graphics meant to stand up. Vinyl Banners, Mesh Prints, Window Display, Perforated Prints, Fabric Prints, Acrylic Prints, etc. Talk to a outdoor sign specialist at Pro Image. We have a long list of sign and graphics solutions for commercial sign contractors. From double sided vinyl banner signs to perforated window graphics to rigid street signs, we can partner you in the project. We can't publish the prices without knowing the details of the project, but you know we are always fair in price. If one side of the print is longer than the other side by 1 to 2 ratio or wider, add a surcharge to the standard prices. If the print shape is wider than 1:2 ratio such as in 10"x25" or 30"x 75". If the print shape is wider than 1:4 ratio such as in 10"x100"
We produce most sizes up to 6 ft by 100 ft uncut. The price is determined by square foot of the print. Examples: 24"x36" is 6 sq.ft. or 30"x36" is 7.5 sq.ft. but is subject to 8 sq.ft. price. If the print is a panoramic format wider than 1:2 ratio, refer to Panoramic Format surcharges above. For HD Aluminum and PlexiPrint, extra small or large sizes are available. *Standard HD Aluminum print size is limited to 30"x40" ($400). Get a quotation for extra custom sizes. ** PlexiPrint Matte finish is available for a 15% surchage. Matte glass absorbs reflections while giving equal visual depth. ** PlexiPrint (glossy) is made with 0.04" thick glass. Add a 10% surchage for 0.25" glass option. ** PlexiPrint is also made in circular shapes up to 50" dia. The price is equal to a suare size. Ex: Ø50" equals 50"x50" price.